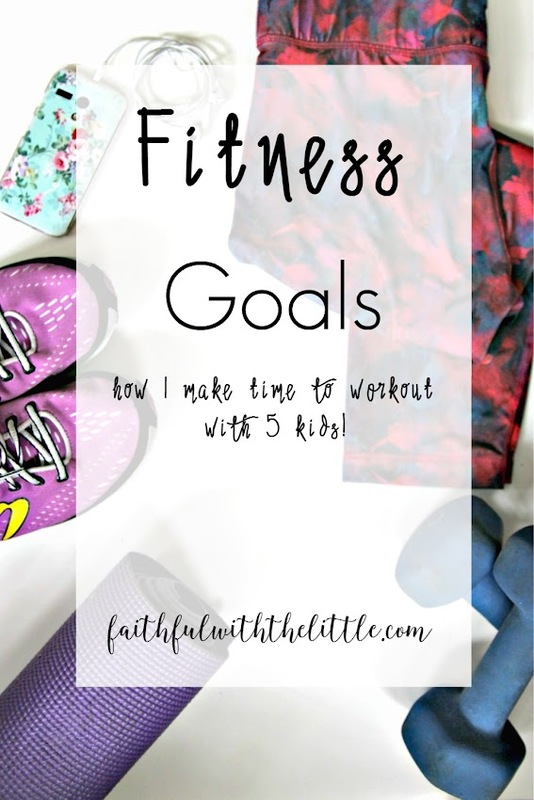 faithful with the little: Fitness Goals/ and how I make time to workout with 5 kids! Fitness Goals/ and how I make time to workout with 5 kids! At the beginning of the year I made some practical goals for myself. I am usually a pretty motivated person(depending on what mood I am in) so I knew these wouldn't be too far out of my reach but would push me a little further then maybe I would go on my own. I shared with you how I set out to master my goal of meal planning and have been posting my 2 week meal plans and some of our favorite meals. Now that I have that goal under my belt I feel it's high time I share with you my fitness goals. I honestly have come to love working out. I really like being fit and in shape. I get depressed when I start gaining weight and am not able to fit into my clothes. I also really like to eat. Exercising has not only been a way for me to feel healthy and fit into my clothes, but has been so great for my state of mind and sanity. I know not everyone feels this way and I want you to know I am not just saying this. I really do thrive on working out. My intention is not to make you feel bad if you don't but to hopefully inspire and encourage you if you have been wanting to start. It is possible! I really started getting into fitness after I had my first born. My kids have been my greatest motivation! I wanted to lose the baby weight so I started running with him in the baby jogger. Over the years I started running on my own, as you can't fit 5 kids in a jogger and I really just needed a break from them. My husband has been so great to watch them when I go running and has been very supportive. Though I loved running, I felt like I was missing something and joined a bootcamp. I absolutely loved it! I wished I had started it a lot sooner. I have always been competitive and loved a challenge. It was just what I needed to push me further then I would have pushed myself. The addition of weights and and different exercises brought me to a whole new level. So I was doing pretty good till last Christmas and that's where I kind of got a little off track. I was still running and working out but not as much as I should. I also started noticing that my metabolism was slowing down. Boo hoo! I couldn't just eat what I wanted anymore and burn it off. I guess that's what happens when you get in your 30's. I was hoping that would never happen but reality set in...in my hips and other places! The bootcamp I attend meets everyday at different times. I have been going to the ones in the early morn at 5:30 am because it gets my day off to a great start, doesn't take away from my family and my husband can always watch the kids;) It meets at those times 3x a week. On the days it doesn't meet I try to go run on my own or with a friend. I usually do one long run(6 miles) once a week, 4 miles with a friend in the middle and maybe 2- 4 again by myself. We also run usually a mile or 2 every bootcamp. If I don't make it to boot camp or get to run I usually put in a workout video/ or watch some workouts on the internet. I really like fitnessblender.com They have some great workouts that are either short or long, and they are free! I also have been using the Jillian Michaels 30 day shred and some of her other workout videos. I still have to get up early to do these at home because it is pretty much impossible when my kids wake up, though I do it when I just have to. If I haven't gotten in a workout early in the day I might go outside with the kids and bring my weight and mat out there. Since I have worked out so much I usually can just wing it myself, but it is always nice just to have someone to tell you what to do. All this to say there are many days when things don't go as planned, I feel unmotivated, I just need to sleep in and the circumstances of life take precedence. On those days I give myself grace and try to jump back in and start where I can. The thing about exercising that can be frustrating is that if you don't keep up with it, you will fall behind and sometimes feel like you have to start all over again, which is why I really want to focus on maintaining my weight and being consistent. Along with what I am doing with my body I know that what I am putting in it is just as important. As my metabolism has been changing I have been trying to cut back on foods that trigger weight gain for me...like ice cream and sweets. I have such a sweet tooth. I don't deprive myself completely but I have been trying to replace treats with a yummy smoothie or shake instead. I also have been trying to eat smaller meals throughout the day instead of 3 big meals. I find it's better to eat when I am mildly hungry instead of waiting until I am starving. I also find that eating late is a no no for me. I always feel so bad at night when I eat after 7. My husband and I always have loved noshing after the kids go to bed while we watch our favorite show but I know if I want to stay at a good weight I have to change my bad habits. Thankfully my husband has been trying to eat better also so it has been much easier to kick this habit. If we do want something we usually make a smoothie. Staying fit can be such a great and hard thing to do. Add to that having children and it can be even harder but also greater. I have found that making time for myself to not only exercise but have an outlet, has been key to giving me strength and sanity to do what I have to do as wife and mom. I never ever regret getting up early and working out, but I always regret when I don't. I hope to share more in depth soon about my love for running and some things that keep me motivated to keep my fitness goals. Did you make some fitness goals at the beginning of the year? How do you find time to workout with kids? Do you love or hate working out? I am so glad this post resonated with you Kristine! I am always impressed by all that you accomplish with your kiddos. Exercising really is so invgorating! Glad you are feeling better Abby! It really can be hard to get back into a good routine after a set back. I'm so glad you were able to start again. It really does grow on you once you get into it! I'm so blessed that you were encouraged by this post! You are very inspiring, Rebekah, especially that you can do all this with five kids and homeschooling. I am without excuse!! Lol ;) As you know, I've tried to change my health habits since the start of the year. I had a patch of going backwards, but this month have kicked myself back into gear. I run three times a week, but with the weather turning, I'm getting my cardio on the rowing machine and some pilates on the side. I am feeling really good and hate it when I don't exercise. Thanks Sarah! It really has been a process for me and I feel like I kick it up a gear each year.I wouldn't be able to do it as much as I do without my husband though;) That's so great you are able to find what works best for you! Thanks Nicole! Ha ha, yes even with one kid it can be hard! But if you make it a priority I'm sure you will find ways for it to happen and be so happy that you did! I've had great stretches of consistent exercising... and some not-so-great stretches of consistent laziness, and the former is better than that latter! It's always helped me if I have a schedule or a goal, like a race coming up. If I know what I'm working toward, I'm more likely to stick with it! Thanks for this good reminder. I'm definitely going to fit that run in today! Fitness goals . . . . um guess I'm not that kind of person! I do like to walk and get out almost every day to walk the dog with my girls, but that's more of a stroll! Haven't been motivated well to get out of bed soon enough to get a walk in early lately; my excuse is that my husband has been leaving for work earlier, so I don't have time to fit it in. But that is an excuse . . . I should figure out how to make it happen since I love the cool, quiet morning air. So I made no fitness goals at the beginning of this year but this month sat down and did some serious health/fitness planning. I found I was opting to do everything else but take care of my body - as a result I have gained weight, have less flexibility, and stamina. I'm meal planning, eating smaller portions, and trying to exercise daily (Darebee's fitness site, exercise bike, and yoga). Great tips! I'm pinning this to my Deliberate Exercise board. Such helpful goals! This is really encouraging and an area I want to be more intentional with. Sometimes I love to work out and sometimes I hate it (hate's a strong word-maybe I'm just lazy). I am noticing a metabolic slow down as I approach 30 (or else a thyroid problem) because I can't seem to lose a pound no matter how little I eat). You sound pretty dedicated, and I applaud you for it! I can usually stay dedicated for awhile, but then I burnout and slack off. I need to find a happy medium! 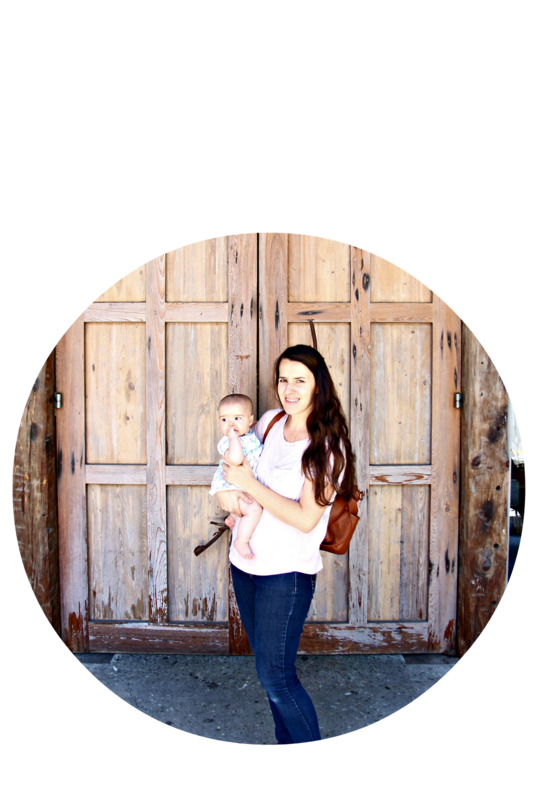 Thanks for adding this post to the Family Joy Linky Party! Yeah, me too! Getting older is no fun;) I am thankful I love to workout but there are days I do force myself when I am not feeling it. Hope you find what works for you!